Oxford Ancestors have since announced that they will not be closing down. See my blog post Oxford Ancestors is not dead yet. 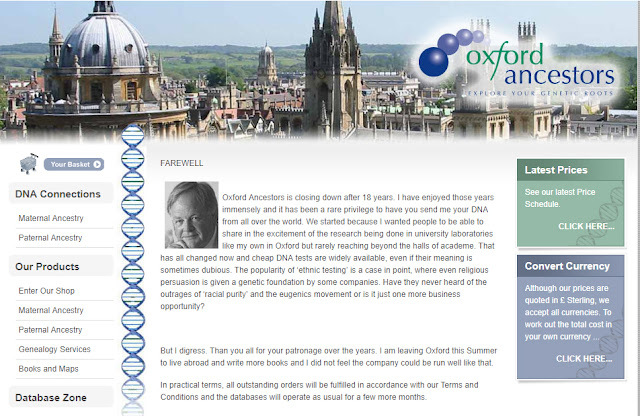 Oxford Ancestors is closing down after 18 years. I have enjoyed those years immensely and it has been a rare privilege to have you send me your DNA from all over the world. We started because I wanted people to be able to share in the excitement of the research being done in university laboratories like my own in Oxford but rarely reaching beyond the halls of academe. That has all changed now and cheap DNA tests are widely available, even if their meaning is sometimes dubious. The popularity of ‘ethnic testing’ is a case in point, where even religious persuasion is given a genetic foundation by some companies. Have they never heard of the outrages of ‘racial purity’ and the eugenics movement or is it just one more business opportunity? But I digress. Thank you all for your patronage over the years. I am leaving Oxford this Summer to live abroad and write more books and I did not feel the company could be run well like that. In practical terms, all outstanding orders will be fulfilled in accordance with our Terms and Conditions and the databases will operate as usual for a few more months. Oxford Ancestors was launched in May 2000 and was the first UK company to offer genetic ancestry tests direct to the consumer. Family Tree DNA and Gene Tree launched in the US at around the same time. Of these three founding companies, only Family Tree DNA is now still in business. Oxford Ancestors initially offered a mitochondrial DNA test and later added a Y-chromosome DNA test along with a Male Match service. Both tests were low resolution – an HVR1 mtDNA test and a 10-marker Y-STR test. Unlike their competitors, Oxford Ancestors did not upgrade their offerings and did not drop their prices as the technology improved. The current Oxford Ancestors Matriline test costs £199 but still only covers HVR1 (400 bases of the 16569 bases on the mtDNA genome). Family Tree DNA now offers a full mitochondrial sequence test (sequencing all 16569 bases) for US $199 (£142). If you're lucky and you buy the test in a sale, and at a time when the exchange rate is favourable, it's possible to get a full sequence test at FTDNA for just over £100. A full mtDNA sequence test is also available from YSEQ for US $165 (£118) though without the benefit of a large matching database. The current Oxford Ancestors Y-clan test covers just 26 markers (Y-STRs) which is still insufficient to distinguish between different surname lineages. Family Tree DNA began offering a 37-marker test in December 2003, a 67-marker test in August 2006 and a 111-marker test in April 2011. YSEQ also offers a range of Y-STR panels. It's now also possible to buy comprehensive Y-chromosome sequencing tests such as the BigY from Family Tree DNA and the Y-Elite from Full Genomes Corporation, though the cost of these tests is still beyond the reach of the average genealogist. Because of the high prices and the low resolution of the Oxford Ancestors tests, the genealogists who had originally started surname projects at Oxford Ancestors gradually migrated their projects to other companies, and mostly to Family Tree DNA. Today FTDNA have a monopoly on surname projects. There are now 9,950 surname projects at FTDNA representing 559,646 unique surnames. However, despite the limitations of the tests offered by Oxford Ancestors, the company has earned its rightful place in the history of genetic genealogy. Many of the pioneers of the genetic genealogy community were introduced to DNA testing by Oxford Ancestors. Ann Turner, co-author with Megan Smolenyak of Trace Your Roots With DNA, took an mtDNA test with Oxford Ancestors which inspired her to launch the Genealogy DNA list on Rootsweb, the first ever genetic genealogy mailing list. The groundbreaking paper by Bryan Sykes and Catherine Irven on Surnames and the Y-chromosome (Am J Hum Genet 2000 66(4): 1417-1419) inspired a number of pioneering genealogists to start DNA projects for their surname. Chris Pomery was the first person in the UK to set up a surname DNA project outside of academia. He started the Pomeroy DNA Project at Oxford Ancestors in September 2000, later transferring to DNA Heritage and then Family Tree DNA. I first heard about DNA testing for genealogy when I joined the Guild of One-Name Studies at the beginning of 2006. I set up my Cruwys DNA Project at Family Tree DNA after hearing Chris Pomery speak about DNA and surnames at a local family history meeting. The demise of Oxford Ancestors is a timely reminder that nothing lasts forever. In the time I've been involved in genetic genealogy I've already witnessed the demise of three other British companies – Family Genetics, DNA Heritage and BritainsDNA. Many companies in other countries have also folded or been taken over. Although the market is now dominated by a few large companies there is no guarantee that any of them will still be here in ten or twenty years' time. Following the LOCKSS mantra (Lots of Copies Keep Stuff Safe), I always recommend getting your DNA in as many different databases as possible. If you've tested at Family Tree DNA make sure you fill out the beneficiary form. If you've tested elsewhere you can share your log in details with a trusted friend or relative to ensure that your DNA record can continue working for you in the long term. It's also important to make sure that you download copies of your DNA results and your raw data. If you're running a DNA project make sure you have downloaded all the project data to your own computer for backup. I think it's unlikely that anyone is now running a DNA project at Oxford Ancestors but, if you are, you will want to make sure you download all the available data while you have the chance. If you're a member of the Guild of One-Name Studies you can contact our DNA Advisor, Susan Meates, and she will help you to migrate your project to Family Tree DNA. See the DNA section on the Guild website for Susan's contact details. Thanks to Andrew Millard for alerting us to the news in the ISOGG Facebook group. 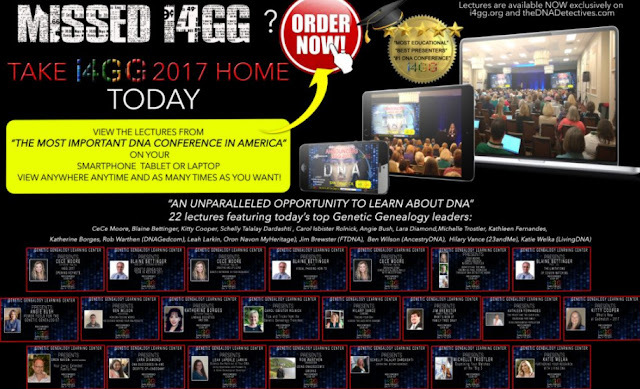 The Institute for Genetic Genealogy (i4gg) is a two-day conference held annually in the US. The 2017 conference took place in San Diego, California, in December 2017. Many of the top names in American genetic genealogy, such as Blaine Bettinger and Ce Ce Moore, were presenting at this conference. There were also talks from representatives from the five major testing companies. All the sessions were recorded and these recordings are now available to purchase online. You can either purchase the videos individually for $10 each or pay $99 to access all 22 recordings. There are some very interesting talks and I've already bought access to the entire programme and am looking forward to watching them all. To see the full programme and purchase the videos click here. I had a wonderful time in February in Belfast attending the first ever Genetic Genealogy Ireland/Back To Our Past conference in Northern Ireland. It was a great opportunity to meet up with my genetic genealogy friends and we took a few extra days in Belfast to see some of the sights. The conference was held in the magnificent Titanic Centre which is a fantastic venue in its own right with first-class facilities. We were based in the Titanic Suite on the top floor which features a replica of the Titanic staircase. There were over forty exhibitors though it was a shame that the two biggest genealogy companies, Ancestry and Findmypast, were not represented. Family Tree DNA and MyHeritage DNA were the only two DNA companies present. The feedback from the show was very positive so I'm hoping we'll all be back again next year with an even bigger and better event. My talk was on some of the mysteries of the Titanic that were solved by DNA. Ed Gilbert gave us an update on the Irish DNA Atlas Project. Look out for more videos from the conference on the Genetic Genealogy Ireland YouTube channel over the next couple of weeks. See the Genetic Genealogy Ireland blog for the full lecture schedule. Recordings of the presentation from the October 2017 Genetic Genealogy Ireland conference in Dublin will also be added once the Belfast lectures are all online. While we were in Belfast a number of us signed up to go on two Game of Thrones tours which provided a great opportunity to see some of the stunning coastal scenery and countryside in Northern Ireland. 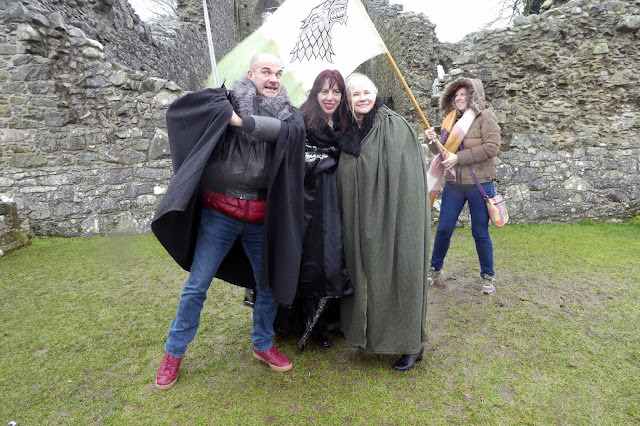 Both tours were led by extras from the Game of Thrones. They were very entertaining hosts and gave us some fascinating insights into how the shows were made. The Iron Islands Tour took us north of Belfast along the County Antrim coast up to the Giant's Causeway. The Winterfell Locations Trek allowed us to explore the countryside to the south of Belfast and took us into the Tollymore Forest at the foot of the Mourne Mountains. This location was used in the filming of the first ever episode of the first series of Game of Thrones. The forest also provided the inspiration for the Narnia books by C. S. Lewis. These were my all-time favourite books as a child. If you ever get the chance to visit Belfast I can highly recommend both of these tours. I wasn't previously very interested in watching Game of Thrones but now, inspired by my trip, I'm determined to try and catch up on the DVDs. My husband is a great fan of the programme but had failed to convince me to watch it. After the conference we had a free day to explore the exhibition at the Titanic Centre. I've shared below a selection of the photographs I took in Dublin which I hope will give you a sense of all the fun we had and what a wonderful country Northern Ireland is. The Titanic Centre viewed from the harbour. The entrance to the Titanic Centre. Carnlough Harbour was the location used for Braavo's Canal in the Game of Thrones. Daenerys Targaryen (aka Linda) and Catelyn Stark (aka Katherine) at Carnlough Harbour. braving the cold near Carrick-a-Rede rope bridge. helped to answer questions about DNA testing in our panel session! The SS Nomadic was specially built to transfer White Star passengers onto the Titanic at Cherbourg. There has been a lot of exciting news from MyHeritage DNA at Rootstech in the last few days. For genetic genealogists the most important announcement is the launch of a major upgrade to the chromosome browser and the ability to download our match lists and matching segment data. MyHeritage very helpfully provides a country flag so that you can see where the person lives and this information is included in the downloaded match list. This will be a very useful way of filtering our matches so that we can focus on the matches who live in the countries where we stand the best chance of finding the genealogical connections. I currently have 2157 matches at MyHeritage. 1214 of those matches are in the US. However, I'm very encouraged to see that I have 232 matches from Great Britain, 72 from Australia, 14 from Ireland and 27 from New Zealand. More surprisingly, however, I also have matches from people living in countries where I wouldn't expect to have genealogical connections, such as Belgium, Germany, the Netherlands, Norway, Portugal, Spain and Switzerland. Many of the low confidence matches are likely to be false matches. Of my my 2063 matches at MyHeritage 768 match my dad and 699 match my mum. This means that 71% of my matches match one of my parents, but conversely 29% of my matches don't match either of my parents and are therefore not likely to be true matches. Of the matches that are real, I suspect that the vast majority of matches with Americans and continental Europeans are likely to be very distant and a reflection of our shared European ancestry within the last one thousand years rather than having any genealogical significance. The upgraded chromosome browser now allows us to compare up to seven people at a time. The browser includes a feature that allows us to see which segments triangulate with each other. This is what is known as true triangulation. For segments to truly triangulate they must not just overlap in the browser but each person in the group must also match each other. Here's a screenshot of the new one-to-many chromosome browser feature. I am the focus person and I'm doing a comparison with my top match at MyHeritage and my dad. If I scroll down and look at the match in the chromosome browser I can see the regions of each chromosome that we share in common, along with details of the amount of sharing. You can add additional people to the group to see if they also triangulate on the same segment but you need to add people one at a time and check each triangulation individually because everyone in the group has to match each other. If just one person in the group doesn't match the others then the circle around the segment will not appear. In my initial exploration of the new MyHeritage features I've noticed that a lot of my matches all seem to pile up on the same segment. A number of us have noticed big pile-ups at the start of chromosome 15 (see this discussion in the Genetic Genealogy Tips and Techniques group on Facebook). I've found that, while some of the people who appear to match on chromosome 15 don't triangulate and the matches are probably not real because of the low SNP count, there are other matches that do triangulate. I'm not certain at present if these matches will be worth pursuing. I've also got another problematic area on chromosome 3 where 15 people triangulate on the same segment. Seven of these people triangulate with me and my dad on a 14.6 segment which contains 5162 SNPs. The remaining eight people in this group triangulate on a smaller portion of this segment. One person in this triangulated group is in the Netherlands and the remaining 14 people are all in the US. As all my ancestry is from the British Isles this is clearly not a genealogically relevant match. We will need to be very careful when drawing conclusions about triangulated segments viewed in the chromosome browser. It's not just the seven matches you can see in the chromosome browser that you need to consider but also how many other people share the segment. The more frequent the segment is in the population the less likely it is to fall within a meaningful genealogical timeframe. I hope that MyHeritage might consider adding an algorithm along the lines of AncestryDNA's Timber algorithm which would downweight matches on portions of the genome which are prone to over-matching. MyHeritage has announced the launch of DNA Quest, an initiative which will provide 15,000 free DNA kits to adoptees. DNA Quest is an expansion of a previous project which provided free kits to reunite adoptees from the Israeli Yemenite community. The programme is currently restricted to US residents, but I'm hoping that it will one day be possible to expand the programme to other countries in need such as Ireland. 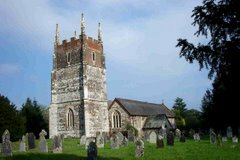 MyHeritage has also announced the release of a number of new data collections including the 1939 Register, which is an important resource for tracing twentieth century ancestors in England and Wales and serves as a census substitute. The 1939 Register was previously only available on Findmypast. It is available at MyHeritage with a data subscription. MyHeritage scientists have published a groundbreaking paper in the prestigious journal Science. They used public family trees at Geni.com to explore migrations and longevity. 101 is an American term for a lecture aimed at beginners but this was actually quite a technical lecture looking at how the MyHeritage matching process works and included useful explanations about phasing, imputation and stitching. MyHeritage have been very responsive to feedback from the genetic genealogy community. I'm excited to see all these new developments and I look forward to many more updates in the coming year. If you're not yet in the MyHeritage DNA database but you've tested elsewhere you can currently do a free transfer using this link. The lunchtime talk given by Gilad Japhet at Rootstech Perspectives on combining genealogy and genetics is now available on the Legacy Family Tree webinar website. Jill Ball has been out and about at Rootstech interviewing some of the speakers and representatives from the various companies and sharing them on her YouTube channel. She has a very interesting interview with Jonny Perl who developed the wonderful new DNA Painter website. Jonny was the very worthy winner of Rootstech's Innovator Showdown Contest. Remarkably he only took his first DNA test in December 2016! You can watch the interview below or direct on YouTube. Jill Ball has also interviewed Hannah Morden of Living DNA at Rootstech. You can watch the interview below or on YouTube. 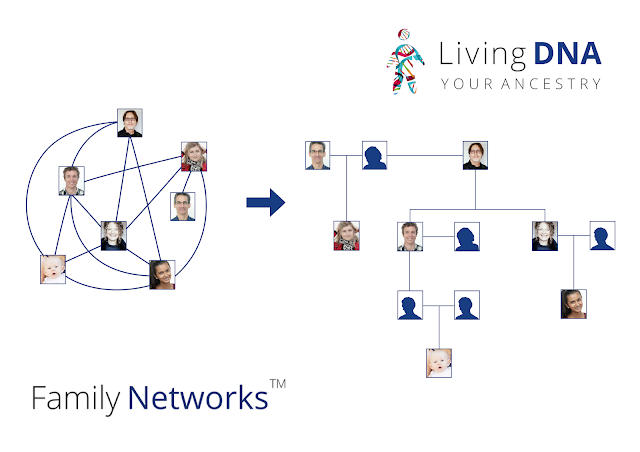 See also my blog post from yesterday on Living DNA's new Family Networks feature. Here is an interview with CeCe Moore, the genetic genealogist on the US TV programme Finding Your Roots. The direct YouTube link can be found here. If you want to keep up with what's going on at Rootstech Randy Seaver is maintaining a useful compilation of blog posts from people who are at the event. He's also written a very helpful post on how to download the free handouts from the various talks. You can watch the Rootstech livestream here. If you missed the livestream you can watch the recordings here. 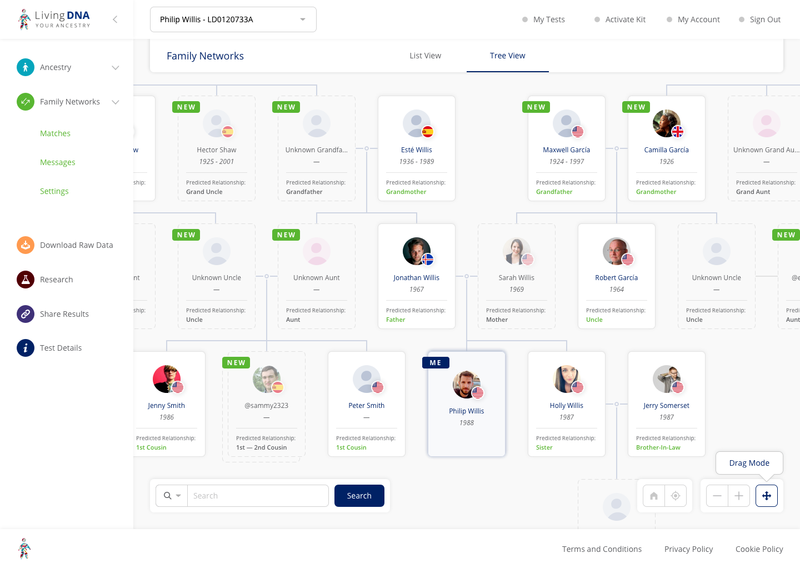 Family Networks is now in private beta-testing and will be in open beta in the third quarter of this year when it will become available to all existing and new Living DNA users. I've been sent a few screenshots which I've reproduced below. Here is a tree view. This is the chromosome browser. This is what the match list will look like. Here is the official press release I received from Living DNA. Officially unveiled in Salt Lake City in Utah at RootsTech 2018, the world’s largest family-history technology conference, Living DNA’s Family Networks requires no prior user-generated family research, allowing users to build a detailed family tree based solely on their DNA, gender, and age. Living DNA will analyse a user's unique motherline and fatherline DNA data (mtDNA and YDNA), on top of the family ancestry line (autosomal) to deliver matches – something no other company can do. Living DNA not only covers a user’s family line ancestry, but—unlike most other tests—it also includes the user’s motherline and (if male) fatherline ancestry. Living DNA’s test itself is run on a custom-built Living DNA Orion Chip. It is one of the first bespoke DNA chips in the world to be built using the latest GSA technology from market leader Illumina, and tests over 656,000 autosomal (family) markers, 4,700 mitochondrial (maternal) markers and 22,000 Y-chromosomal (paternal) markers. There are a few additional details in a slightly different press release which appears on the Living DNA website. The relevant text is reproduced below. Free DNA-Driven Family Tree Reconstruction and Matching System Method Offers Greater Accuracy Than Competing Products, Takes Guesswork Out of DNA Relationships. SALT LAKE CITY, Utah – Feb. 28, 2018 – Living DNA, the global consumer genetics company, today announced it will preview “Family Networks”—a new DNA-driven matching system and family tree reconstruction method—at RootsTech 2018, the world’s largest family-history technology conference taking place Feb. 28 – March 3 in Salt Lake City, Utah. Requiring no prior user-generated family research, Living DNA’s family reconstruction tree method is based solely on users’ DNA, gender, and age. Unlike competing organisations, Living DNA’s Family Networks will provide the most precise matching service on the market by analysing a user's unique motherline and fatherline DNA data (mtDNA and YDNA), on top of the family ancestry line (autosomal). With Family Networks, we not only predict how users are related to direct matches, but we can also infer through DNA up to 13 generations back to connect matches with whom they share no DNA with today,” said Living DNA co-founder and Managing Director David Nicholson. “The technology behind Family Networks runs through millions of ways in which users in the network are related and automatically works out which genetic trees are possible. This new capability offers distinct benefits to a range of users, from avid genealogists to family history hobbyists, to adoptees and others searching for their family members. It will reduce the risk of human error and support the task of figuring out how each person in a user’s list are related to one another. Family Networks will go into private beta in Q2 and open beta in Q3 2018 where it will be available to all existing and new Living DNA users. 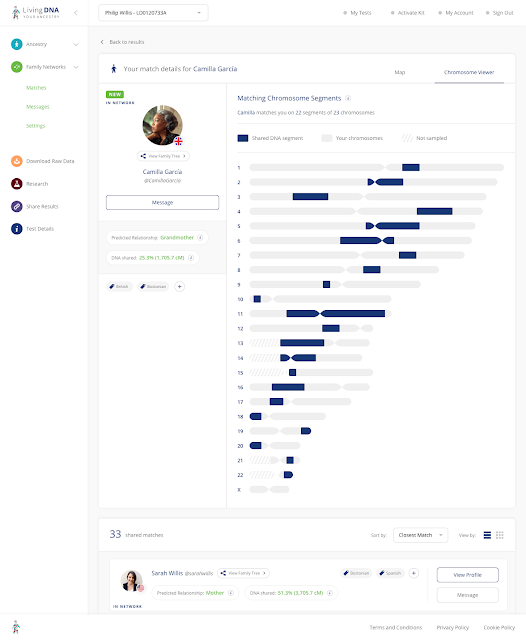 The unique computation this feature provides gives customers - even those who upload from other DNA testing sites - a level of relationship prediction and specificity beyond anything currently on the market. Where competing offerings rely solely on time-consuming and often error-prone user research, Living DNA’s amazing power tools process users’ DNA to identify relatives and define relationships deeper back in time. Through this extremely rich experience, users can even learn how they’re related to people with whom they share no DNA today. Users need to only provide their gender and birthdate for Living DNA to build a family tree that shows where their matches fit into their family tree, with no need of Gedcom files or any other user input. This can be especially useful for adoptees and family searchers who are trying to locate long-lost family members but who don’t have any information on their biological family, Living DNA can translate their matches into a potential family tree, giving them a clearer place to start from. 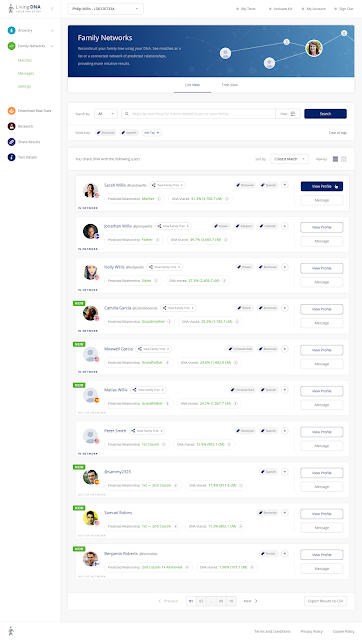 I strongly believe that genetic networks are the future of genetic genealogy so I'm excited to see that Living DNA have developed this new feature. It will be interesting to see how it works out in practice.